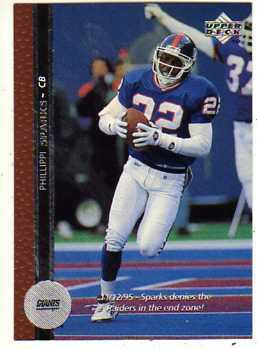 The New York Giants had a one-two punch in the 90′s with Phillippi Sparks playing cornerback opposite Jason Sehorn. Sparks, #22, was drafted in the second round out of Arizona State University in 1992 where he was an All Pac-10 CB. As a finalist for the Thorpe Award as a Sun Devil, Sparks played alongside boyhood friend and future Cowboys legend Darren Woodsen. As a shut-down corner, Sparks combined coverage skills with a fearless approach to hitting that often had him taking on much larger offensive players. With 27 career picks, Phillippi was a staple in the Giants secondary and his stellar play earned him a spot on the All-Madden Team. Twice Sparks had a career-high five interceptions in a season and he finished his career playing for his favorite childhood team, the Dallas Cowboys. Sparks has maintained a high-profile status in the celebrity world as the father of American Idol winner and current pop star, Jordin Sparks. Phillippi Sparks is a member of the ASU Sports Hall of Fame and was a member of the Glendale Community College National Championship team where it was rumored he averaged 50 yards per kickoff return!